This year's Stifterverband Science Award – Erwin Schrödinger Prize goes to an interdisciplinary team of researchers from Heidelberg. Scientists Matthias Eder, Michael Eisenhut, Uwe Haberkorn and Klaus Kopka have jointly developed a method that facilitates more reliable diagnosis as well as more specific treatment of prostate cancer. Presentation of the 2018 Stifterverband Science Award - Erwin Schrödinger Prize at the Helmholtz Annual Meeting. On stage (from the left): Otmar D. Wiestler, President of the Helmholtz Association; Dirk Heinz (Scientific Director, Helmholtz Center for Infection Research – HZI), Matthias Eder (Freiburg University Hospital, German Cancer Consortium and DKFZ), Michael Eisenhut (DKFZ, emeritus), Uwe Haberkorn (Heidelberg University Hospital and DKFZ), Klaus Kopka (DKFZ) and Thomas Rachel, Parliamentary State Secretary to the Federal Minister of Education and Research. The €50,000 Erwin Schrödinger Prize was presented at the Helmholtz Annual Meeting on September 11, 2018, to this year's awardees: Matthias Eder (biotechnologist, Freiburg University Hospital, German Cancer Consortium and German Cancer Research Center – DKFZ), Michael Eisenhut (chemist, DKFZ, emeritus), Uwe Haberkorn (nuclear medicine specialist, Heidelberg University Hospital and DKFZ) and Klaus Kopka (radiopharmaceutical chemist, DKFZ). The scientists have been distinguished for developing a molecule that can specifically detect prostate cancer cells and improve both diagnosis and therapy of prostate cancer. "The four award winners have impressively demonstrated how translation can be achieved: Only by close and well-coordinated collaboration of natural scientists from various disciplines with clinicians is it possible to transfer developments from the laboratory into clinical application so rapidly," said DKFZ Chairman Michael Baumann. "The PSMA agents will help patients with prostate cancer throughout the world – this outstanding collaborative achievement highly deserves the Schrödinger Prize." 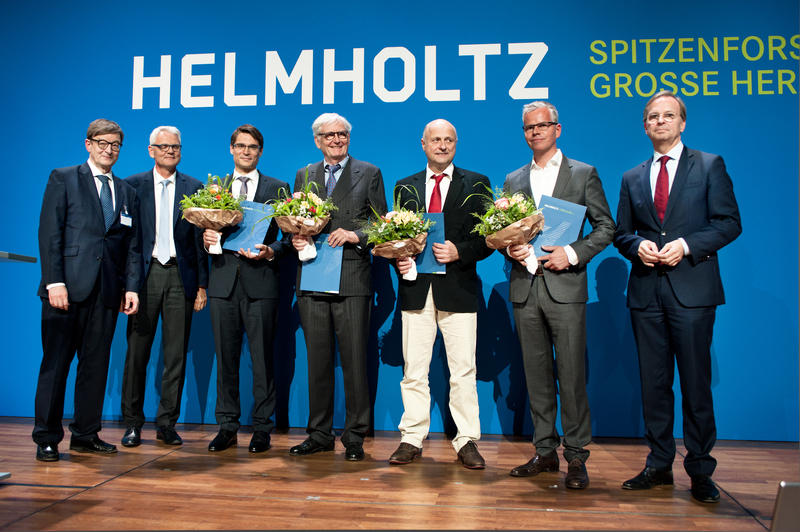 "I sincerely congratulate the award winners," said Helmholtz President Otmar Wiestler. "With their method, they not only revolutionized the imaging of prostate cancer cells but they have also achieved a breakthrough in tumor therapy. I am sure that this will make it possible to help many prostate cancer patients in the future. This is an impressive demonstration of what science can move forward when it collaborates across borders of individual disciplines." The Stifterverband Science Award – Erwin Schrödinger Prize annually recognizes innovative accomplishments achieved at the interface between various disciplines in medicine, the natural sciences and engineering. The prize is awarded alternately by the Stifterverband and the Helmholtz Association. The starting point of the award-winning team's discovery is a protein called prostate-specific membrane antigen (PSMA). It is normally present on the surface of healthy prostate cells, but is found at much higher levels on prostate cancer cells. It is barely found in the rest of the body. The scientists have developed a small molecule called PSMA-11 that is capable of specifically attaching to these antigens and can be labeled with various radioactive substances, called radionuclides. Thanks to these labels, physicians are able to recognize even the smallest assemblies of prostate cancer cells in PET (positron emission tomography) scans of patients. Diagnostic approaches that have been used so far have not come close to this sensitivity. The method is by now being used in patients worldwide to detect prostate cancer cells. Based on this molecule, the researchers developed a similar agent called PSMA-617. It is labeled with a stronger radionuclide in order to make it effective as a therapeutic substance. This radiopharmaceutical destroys prostate cancer cells as soon as the molecule has attached to them. First results achieved were so promising that the scientists have licensed out their discovery to a US pharmaceutical company. Presently, a clinical trial is being conducted with the participation of more than 80 cancer centers in nine countries around the world. The scientists hope that in a few years' time, after completion of all test runs, the treatment will have been approved by health authorities. In this case, only about ten years would have passed since work on the topic began in 2011. "Our work – and the breakthrough after this short time – would not have been possible without the combined effort of various disciplines," the researchers involved say. Caption: Presentation of the 2018 Stifterverband Science Award - Erwin Schrödinger Prize at the Helmholtz Annual Meeting. On stage (from the left): Otmar D. Wiestler, President of the Helmholtz Association; Dirk Heinz (Scientific Director, Helmholtz Center for Infection Research – HZI), Matthias Eder (Freiburg University Hospital, German Cancer Consortium and DKFZ), Michael Eisenhut (DKFZ, emeritus), Uwe Haberkorn (Heidelberg University Hospital and DKFZ), Klaus Kopka (DKFZ) and Thomas Rachel, Parliamentary State Secretary to the Federal Minister of Education and Research. Use is free of charge. The German Cancer Research Center (Deutsches Krebsforschungszentrum, DKFZ) permits one-time use in the context of reporting about the topic covered in the press release. Images have to be cited as follows: "Source: Helmholtz/Boris Kramarić".